Aix’s Book in Bar in New Novel! In the UK, 2018 is the centenary of winning Votes for Women: the suffrage campaign finally won through! Women over 30 (or at least the great majority of them) finally won the right to vote in parliamentary elections; women over the age of 21 had to wait until 1928 to gain full equal voting rights with men. Suffragists relied on constitutional tactics (keeping within the law), while suffragettes took militant action, often resulting in imprisonment. Next week, British academic Jill Liddington will be at Book in Bar in Aix giving what will no doubt be an impassioned account of this struggle: Jill was Reader in Gender History at Leeds University and is currently an Honorary Research Fellow at the Centre for Interdisciplinary Gender Studies. She specialises in the actions of women in the north of England, often working class and somewhat side lined by historians in favour of better-known activists in London. Her book ‘Rebel Girls’ profiles some of these courageous northern women. Her book, ‘Histoire des suffragistes radicales’, was published here in France last month. This is a free talk – not to be missed! If you love books, there are four events coming up which should appeal. The English Book Club who meet at Book In Bar will be discussing ‘The Spinning Heart’ by Irish novelist Donal Ryan. It’s set in the aftermath of Ireland’s financial crisis and its effects on the people in one community. It sounds a stimulating read. Review here: http://www.theguardian.com/books/2013/nov/28/spinning-heart-donal-ryan-review. Thursday February 27th, 17:30. Some news on the literary front. The AAGP (Anglo-American Group of Provence) are having their annual booksale on April 6th – from 9:30 to 3:30 at the Maison des Associations (behind the Mairie Annexe at Pont de l’Arc). They always have a huge range of books, at very low prices and say they need lots of buyers to give them good new homes. Repatriating families donate their libraries for resale and there are usually good children’s books. Free tea and coffee – and you don’t have to be a member to take advantage of this sale. Meanwhile Book In Bar has announced its forthcoming events, a little in the future but useful to have details so we can read the authors first. On Friday April 5th, 17:30 Beverley Naidoo will be at the bookshop, talking about her work. She was born in South Africe and then educated in England where she reflected on her early experiences in her book ‘Journey to Jo’burg’. On Saturday 8th June at 17:00 British novelist Jonathan Coe is the guest writer. He has published a series of successful novels – his latest ‘The Terrible Privacy of Maxwell Sim‘ finds narrative interest in a journey along UK’s M40 and brings us a modern Everyman. More about him on www.jonathancoewriter.com. If you read Cloud Atlas, which was a hit with our book-group, you may like to see the film version. I was unsure as it’s such a challenging narrative, but I heard a review panel on BBC Radio and all three people had not wanted to see it…and then thoroughly enjoyed it. It’s in VO alternating with the French version at the Cézanne. There are so many events coming up – Christmassy and otherwise. Here we go! The Christmas market is now in full swing down the cours Mirabeau. The chalets seem to me to be identical to the ones last year and the year before that so they must be able to cover their 2,700€ rental. Certainly the hot spiced wine chalet and the magic man seemed busy when I walked past. It’s open 10-19:00hrs daily. Plus, every day, there will be special events, Corsican singing, medieval dancing, Aixois rap, demos of guide dogs – lots of activities which are listed on www.mairie-aixenprovence.fr/festivites-de-noel-2012 if you haven’t been able to find a flyer. Tuesday sees the opening of an exhibition of the abstract paintings of Giovanna Buttice and Annick Deroux at the Galerie Aix-positions, 29 rue Lisse des Cordeliers (bottom of Cours Sextius). It’s on til Saturday Dec 1st and the vernissage is Tuesday at 17:00. Wednesday is the opening day for the International Market when our twin towns come to Aix to give us a taste, often literally, of their typical food, drinks and crafts. New this year are stalls from Baalbek, Lebanon, Ashkelon, Israel and Kumamoto, Japan who have just signed a letter of ‘intention de partenariat’ with Aix. It’s always an interesting event with the people fromPerugia usually drawing a crowd for their Italian goodies. Bath is the British twin and this year the mayor is attending. It opens as 12:00 on Wed, then it’s 10-19:00 until 2nd Dec, Place François Villon, Les Allées Provencales. www.aix-jumelages.com. On Thursday, photographer Bernard Plossu will be signing copies of his book of photos of Mont Sainte-Victoire at the bookshop Harmoni-Mundi, place du Verdun, at 19:00hrs. This is a tie-in with his exhibition at the Musée Granet which is on for another couple of weeks. He’s a really nice guy who speaks English thanks to his years working in the US….and he likes meeting people who are interested in photography. Friday will be a busy day. 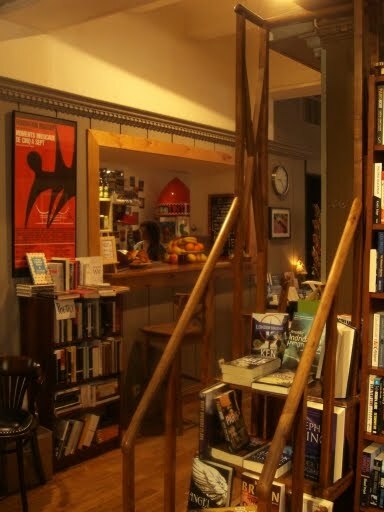 Book In Bar are hosting the Poetry Corner meeting. This month Sheighle Birdthistle is focusing on War Poetry. She will introduce WWI poets and has asked people to contribute readings or suggestions of poets from other wars and conflicts. Should be a good session. 17:30hrs. After that, there’s an expo of paintings at the Deux Garçons which looks interesting. It’s for artists who either work or whose partners work at Iter. It’s on the first floor, from 18-22:00hrs, Friday only. On Saturday, if you still have energy, why not visit the Christmas Fayre at the English Bubble? You may have seen its owner Caroline this week on the front page of Aix City Local News adorned with lots of union jacks? Her cultural centre ,which welcomes children and adults who wish to learn English or meet Anglophones, has been a great success. She also sells lots of English necessities like Heinz beans and marmite and usually has mince pies and crackers at this time of year. The event takes place 14-19:00hrs and there is ceramics painting for children while their parents shop. 453 Ave Jean- Paul Coste, Val St André, Aix. Carrefour will be opening from this coming Sunday (2nd) every Sunday until Christmas – and they have parsnips!